I would encourage everyone to go to Galway . It’s such a great place and undoubtedly the liveliest city in Ireland . However having been there during race week I would not go back at that time. It’s just too manic. Plus it’s a punter marathon with seven consecutive racing days. So unless you are 25 – or have the stamina of a 25 year old – and also have a bullet proof betting system I would recommend that you visit this great city on another occasion. The week prior to race week is a good time. There’s a two day fixture at Ballinrobe - which is just 30 miles north of Galway - plus the Galway Arts Festival which runs from 16-29 July. (Always buy your tickets in advance (online) as popular events sell out quickly). I flew out from Birmingham on Friday 20th which gave me the opportunity to attend a few festival events over the weekend before going up to Ballinrobe for the races. I flew into Knock and drove down to Galway . 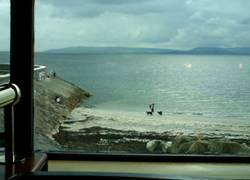 I stayed in a hotel in Salthill which is a two mile walk into the city – albeit a very pleasant walk along the seafront promenade. Salthill will be a bit too commercial for many; it’s a bit like a mini Blackpool . Clacton and Paignton also spring to mind. Friday night I’d booked to see a Cormac McCarthy play and followed this on Saturday at Roisin Dubh to see Irish songster Mundy perform. The food was very good too! Sunday was also the musical highlight: the Cuban guitar legend Eliades Ochoa and his band. You may not recognise the name but you’ve probably heard of his previous band - Buena Vista Social Club. 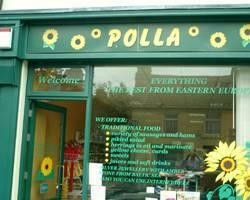 The window banner states; “Everything: the best from Eastern Europe ” Which is quite a remarkable find considering Ballinrobe town has a population of just c.4, 000. However the non-Irish population of the region now stands at over 26%. The changing face of West Ireland . 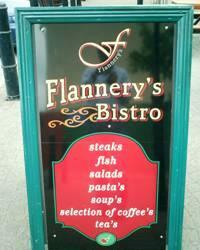 Despite the abundance of unnecessary apostrophes (why soup’s yet steaks? ), this place is well worth a visit not least because lunch is served until 5pm, which is useful if you are attending an evening meeting and want to swerve the hot beef rolls. Go for the homemade soup/open sandwich of the day. Less than a fiver for both. Really excellent Guinness too. I can only assume that there was not enough land available to build it with the balcony facing the track rather than facing the parade ring/bookmakers. I’d not been racing in Ireland for a year so it took me a while to get into my stride. One of the important changes during that time has been the alignment of the Irish Placepot with the U.K. version to allow comingling of the pools. Partly because of my interest in Irish Racing, this is something I proposed and encouraged (on a regular basis) whilst working for Tote Direct from early 2002 until summer 2006. 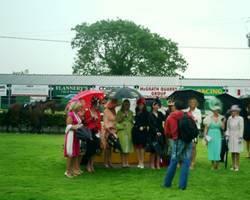 Alas it was not until spring 2007 that a comingling agreement was reached, in time for this year’s Punchestown Festival. Needless to say the effect has been dramatic with Irish Placepot pools rising from a few hundred Euro to tens of thousands. 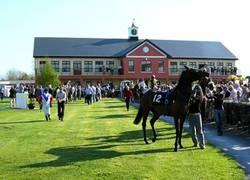 This means the Placepot is now a viable bet at Irish tracks whether you are watching ATR or you are there in person. Remember the one key difference with the UK bet – the 4th horse is included in all races of 16 runners not just handicaps as with the UK version. Despite the difficulty of the card – it started with three tricky handicaps – the Placepot had to be played. A chunky perm was called for: 3x3x3x1x3x2 =162 @ 30 cents = 48.60 Euro. As ever there was also the question of seeking out some value win bets on the tote. My Placepot progressed ok in the three handicaps with one of my three being placed in each race. Race two was particularly good a 15-runner handicap with SPs of 7/1, 14/1 and 20/1. Then my banker obliged in the fourth, and my 5/1 shot won the fifth with good priced places at 8/1 and 11/1. So it was all nicely set up for the last leg a beginners’ chase in which I had two runners, the 5/1 second favourite and a 10/1 shot. The 5/4 favourite was clear during the first circuit but fell at the last bringing down other runners. Unfortunately my two selections were not in contention and thus did not benefit from the carnage. Whilst looking in vain for them to make the frame I overlooked the fact that I’d had a win tote bet on Pirates Punch which won at 10/1 and paid 16.80. This was the first and last pick up of the day and some consolation for the losing Placepot. The Placepot dividend was a respectable 2,150.10. Day two was rather spoilt as it started raining heavily half way through the meeting and continued to do so for the rest of the night. My winner picking didn’t improve either. The “hot beef rolls” marquee had live music which at first sounded promising as the pleasant refrain of “The Fields of Athenry” wafted out into the rain. (This tune is my mobile ring tone!). But the band lost all credibility when “Athenry” seamlessly segued into “Chirpy Chirpy Cheep Cheep”. My punting prowess can be summed up by my opposition to the Ruby Walsh ridden Seamies Dream in the 5th. This looked a two horse race so I backed the other one Dingle Bell. The latter was 3/1 on the tote whereas Ruby’s mount was close to even money. Ruby is always over bet on the tote. The punters love him. Seamies Dream was 6/4 in the ring with Dingle Bell showing at 7/4. Needless to say Ruby rode another perfectly timed race to beat my selection by 11 lengths. So a losing outcome this time in contrast to recent trips but a good craic nonetheless. Back to Knock airport and a couple of hours to kill at the two-storey shed before my flight. A strange place. The newsagent was closed but the “shrine” kiosk was open for business as was a religious statue filled prayer room on the upper floor. I considered relaxing in here with my paperback but realised the punters might think me facetious. I was reading Richard Dawkins’ “The God Delusion”.